Wii All Scream For Ice Cream! 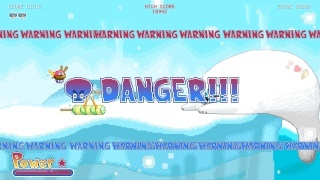 Published and developed by Dolores Entertainment Ice Cream Surfer is a side-scrolling shoot em' up title that has cutesy visuals and several characters each with their own unique powers, while some are pretty good, others are almost unplayable due to their attack range or strength. The game is split up into 6 different zones each with their own boss at the end. 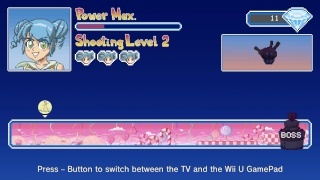 These levels start off easy, but become challenging near the end and the later bosses are very difficult! During the levels you must defeat many waves of enemies while collecting power ups and jewels "points" from the defeated enemies. There are also letters hidden in each level that spell out Ice Cream and if you collect every letter in a stage you'll unlock artwork, however there is at least one stage in the game that it's impossible to obtain every letter which definitely hurts this game's score. The controls in the game are quite smooth and work well with no noticeable issues, however the lack of Off-TV Play is rather unfortunate. The visuals are quite cutesy and are vibrant and colorful which is a nice change of pace from typical shoot em' up titles! The characters themselves are cameos of various icons, movie characters, and anime characters such as Superman and Sailor Moon which is funny to see in action! There are some frame-rate issues that occur throughout the game especially when there's alot going on the screen, however it's more of an aesthetic issue rather than a gameplay impeding issue. The soundtrack is upbeat and fits the game quite well, while the sound effects are decidedly retro and feel very nostalgic to long-time gamers! 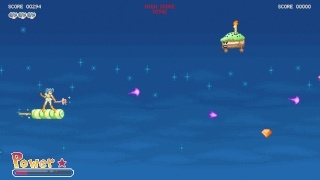 With solid gameplay, great controls, and unique and cheerful visuals and soundtrack Ice Cream Surfer is a game worth checking out and is a breath of fresh air for a game in the shoot em' up genre, however with some collectables being impossible to obtain and the lack of Off-TV Play really hold back this otherwise great game. Still if you can overlook its flaws there's some good fun to be had with this game!